Golden Boy PIES are deep, 9-inch, and made from scratch, with all-natural ingredients (except the non-dairy whipped topping requested by many customers to top our cream pies)! Below you'll find a mouth-watering list of all our regular varieties. We start with our special recipe flaky crust - the sign of a top quality pastry. Then we hand fill each crust with our own fruit fillings (made from fresh-frozen fruits), cream fillings blended with a bit of meringue for extra creaminess (never prepared puddings! 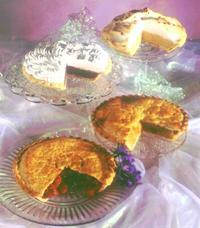 ), or our house recipe specialty fillings (like pumpkin and pecan)! 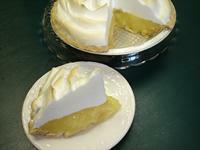 Two of our specialty fillings (key lime and cheesecake) are nestled in a graham cracker crust that is individually pressed into each pie tin using a specially-designed machine. 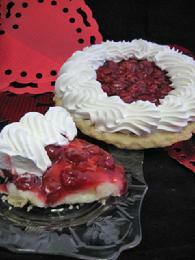 Cream Pies are topped with your choice of a real, honest-to-goodness, old-fashioned meringue, or a creamy non-dairy whipped topping. 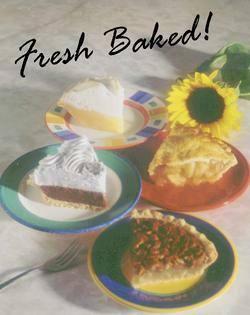 Many of our pies are also available in a No-Sugar-Added version, too! Even though the pies are not boxed, each pie has its own special marking so you can tell which pie is which. Click here for a guide to these Pie Markings. 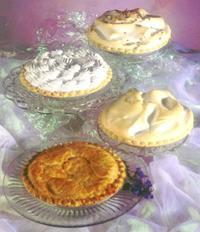 For a printable list of our pies in a ".pdf" (Adobe Reader) format, click here. STRAWBERRY-RHUBARB - a modern twist on the traditional favorite pairs sweet strawberries and tangy rhubarb to help you bridge the generation gap! FRENCH APPLE - our regular apple pie, mounded with our own brown sugar-cinnamon streusel instead of a top crust. FRENCH BLACKBERRY - our blackberry filling loaded with plump-juicy blackberries bursting with flavor, blanketed with our special recipe streusel. FRENCH CHERRY - our regular cherry pie, topped with our homemade streusel. 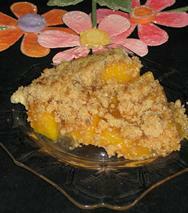 FRENCH PEACH - tree-ripened sun-sweetened peaches in our made from scratch peach filling, in our unique streusel. BANANA FLAVORED - By Customer request - for those who like the flavor of Bananas but not the real fruit! PEANUT BUTTER CREAM - a sweet and creamy favorite, that won't stick to the roof of your mouth! SOUR CREAM RAISIN - a classic marriage of Cinnamon-y Raisin Filling mixed with our Vanilla Cream & just the right amount of real Sour Cream to bring the all the flavors together in a heart-warming harmony! 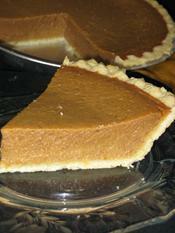 Traditional Pumpkin Pie - also available with a ring of whipped topping! We have so many that you'll have to view them on another page! Click here!